PDF of the entire issue (8.26 Mb). Science minister Lino Barañao dreams of transforming Argentina into an international centre for research. When TWAS convenes in Buenos Aires for the Academy's 24th General Meeting, members will find that the dream is becoming reality. The country's commitment to research and education made it a leader of scientific advancement in the South. In an idyllic setting, Argentina's Instituto Balseiro has become a centre of world-class science. Its character and creativity, however, are distinctly Latin American. To help Guatemalans consume important nutrients, scientists have to be sensitive to local cultural practices, say nutrition researchers. TWAS research fellows are finding that posts in Latin America, though sometimes far from home, are advancing their work on agriculture, health, pollution and other fields. Perfect skies make Chile a global centre for telescope science. Now the country is working to make astronomy a permanent part of its development strategy. A new book from TWAS and COMSATS profiles Colombia's Centro Internacional de Física, which has endured as a model of excellence despite shifting financial and political conditions. Earthquake, drought, climate change – is there a blueprint for policymakers to follow before disaster strikes? The CATALYST project has answers. 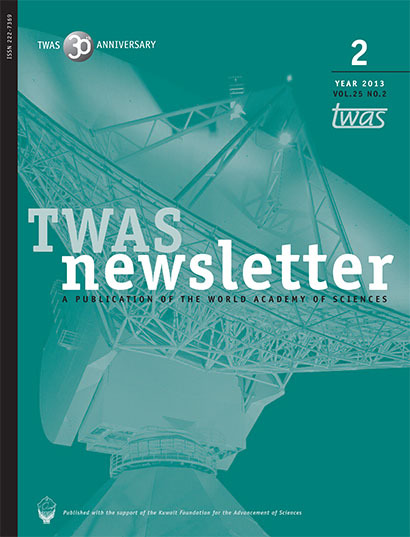 Thirty years ago, the founding of TWAS was met with uncertainty and, in some quarters, skepticism. But founder Abdus Salam had a dream that could not be held back. Reflecting on the Academy's birth and early growth, Mohamed H.A. Hassan, TWAS's long-time executive director, explores key challenges – and successes – in those years. Brief news about honours, appointments, awards and events.